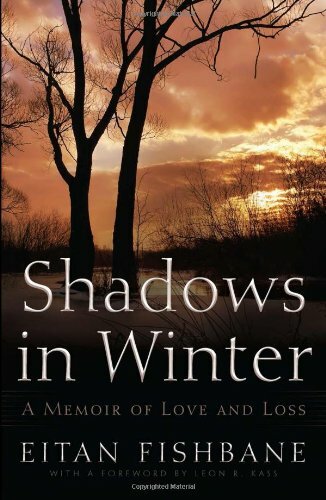 In Shadows in Winter, Eitan Fishbane chronicles his journey through grief in the year following the sudden death of his beloved wife, Leah. Their daughter Aderet is just turning four, and Leah is two months pregnant with her second child when without warning, a previously undiagnosed tumor plunges her deep into a coma. A few days later, she dies without regaining consciousness, and Eitan is a single parent trying to make sense of his own and his young daughter’s loss and grief. Dr. Fishbane’s prose often reads like vignettes or poetry from a personal diary as he writes from the dark place that becomes his world without his wife. His capacity to write from these depths is a testament to both his writing talent and to the quality of his love and despair. In spite of the tragic circumstances and searing honesty about his and Aderet’s agony over their loss, the often intellectual tone keeps it from becoming maudlin, sometimes even keeping the reader at arm’s length. The fragmented fusing of these moments periodically makes the story disjointed and reveals that sense of being untethered and disoriented that characterizes the early stages of mourning. Some of the most tender and poignant scenes are those he shares with four-year-old Aderet as she tries to work through her own grief at losing the mother she adored. She makes up prayer-like songs and draws her Imma pictures and holds drawings Imma made for her up to her ears to hear her say “I love you.” As her precious Imma lies in a coma, she traces her small hand so her father can take it to the hospital and place it over her dying mother’s heart. Dr. Fishbane shares the traditions of the Jewish religion surrounding death and mourning. Readers may find the philosophical tone takes them out of the story. Their inclusion is important for the strength he draws from them and because they expose his journey of faith, as he tries to hold onto the image of a just God in the midst of the injustice of Leah’s tragedy. Ultimately, his journey brings him back to love and hope.